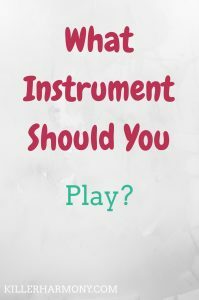 Author HannahPosted on May 29, 2017 June 13, 2017 Categories MusicLeave a comment on What Instrument Should You Play? If you are a musician, there are a few tools that are super important to helping you improve, and there are others that just make life easier. Tools like a tuner and metronome to websites for finding sheet music and learning pieces are extremely helpful. Other music supplies will make your life easier. A lot of these tools can be downloaded to a smartphone or tablet, so you don’t have to worry about carrying so much stuff to lessons or gigs. If you are a beginner, you don’t need to have all of these tools right away, but you should plan on getting them as you advance. There are also certain instrument specific supplies that you will need, such as strings, reeds, or valve oil. 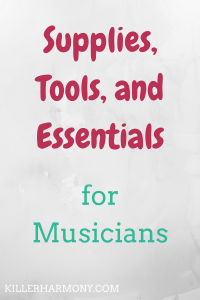 For simplicity, I will stick to basic supplies that can apply to any instrument and musician. This first one seems obvious, but it will really affect you and your playing. You want to have an instrument that will do what you need it to do. If the strings always break or go out of túne, or you have keys that are not aligned correctly, you will struggle more than if those problems weren’t there. Yes, you make the instrument, it does not make you, but repair issues can significantly hinder your progress. You can find decent instruments at a local music store or from a reputable dealer. Please avoid buying instruments are cheap. If you find an instrument that is hundreds of dollars cheaper than every other model, there’s probably a reason for the discrepancy. If you have an instrument, be sure to take it to a repair person regularly. They know more about how to find and fix problems than you do. Having an instrument in good repair will do wonders for your musical career. When you are learning how to play your instrument for the first time or you are learning a new piece, a metronome is necessary. You can set the tempo to as slow or as fast as you want (usually). A metronome will keep you on track when it comes to your speed. If you plan to play with others, even just your teacher or a friend, tempo is crucial to the success of your performance. A piece will not sound good if you are not playing together in time. A metronome will also keep you in time with yourself, and you can use it to slowly work a piece up to tempo. You can buy a physical metronome from your local music store or online, or you can download an app to your phone or tablet. Most musicians will need a tuner. If you play piano, you will not need it every day, but it can be helpful to know when you need to call a piano tuner. If you play an instrument that you tune when you play it, a tuner is essential. You can get a very basic tuning fork, which will sound the note “A,” which you can then match on your own instrument. The most complex tuner you can get allows you to tune to any note, and it will tell you how flat or sharp you are. If you are playing with others, a tuner is super important. It is one thing to note play in time with another musician, and it is another thing to play in the same key as another person. As with metronomes, you can find them in music stores, online, and even bundled with metronomes. As you progress as a musician, it is good to record yourself playing so that you can learn from your mistakes. When you listen to a recording of yourself, you can pick our small things that you ignored when you were playing the piece. You don’t have to record everything, but doing so occasionally allows you to hear what others hear when you play your instrument. You don’t have to worry about editing out all of the problems, because this recording is for you. Eventually, you might want to share your recordings with others, but you don’t have to. For now, you can get by with a simple audio recorder. You can buy them in stores, online, or use the app on your phone. I use and love an app called MusiciansKit, which comes with an audio recorder, tuner, and metronome in one. Assuming that you still use printed sheet music, a pencil is uber important. You can use a pencil to mark in accidentals, tempo and key changes, and make note of other details. It is better to us a pencil than a pen, because the music is not always yours to keep. Even if it is, you might want to erase those marks in the future. Also, if you make some changes after trying something out, you can erase the marks to reflect the changes. A pencil is just a lot cleaner than a pen, because you don’t have to scribble out mistakes or changes. You should probably already own a pencil or two, but you can get a pencil or pencil set almost anywhere. Keep a pencil or two in your case so that you always have one when you need it. When you start using individual sheets of music, you want a place to keep it all safe. This is where pocket folders come in. You can use a simple two pocket folder, or you could get a bit fancy and use one with multiple pockets. Having multiple folders or a folder with multiple sections allows you to keep your music safe and organized. If you play with a few different groups, you don’t want to have to search through three ensembles worth of pieces to find the one you need. I use a multi pocket folder for my music, and I have pockets for warm ups, current solos, past solos, future solos, and notes. When I had different ensembles, I had a folder for each group so that I didn’t mix up my music. In college, I would often have to turn in my folder after a concert, so having just that ensemble’s music in that folder kept me from forgetting anything. You can buy folders at almost any place you can buy pencils. I got my multi pocket folder from Target, and it still works after using it for two years. Unless you have a perfect memory, you will probably have to play with your music on occasion. In those cases, you need a music stand. You can get a cheap wire stand for about ten bucks, or you can spend more on a better quality stand. Keep in mind that some of the heavier stands are not easy to transport. If you want to play in different places, you want a stand that you can take with you. At the same time, the really cheap wire stands can only hold so much weight before toppling over. You can find a music stand at most music stores or online. Amazon has some great deals, and they carry a wide range of options. If you don’t know what to buy, ask for advice from a teacher who can point you in the right direction. Now for some less important but still useful tools. If you will be playing your instrument a lot, or you just don’t want to fuss with the case every time you play it, a stand is super helpful. As tempting as it might be to just leave your instrument on a table or chair or laying on the floor, it will be much safer on a stand. Instrument stands are built to hold your instrument, so you will have much more peace of mind if you put your instrument on a stand that was built for it. These stands can cost money, but think about how much you will save by avoiding an otherwise unnecessary trip to the repair shop. You can find instrument stands, as with other music supplies, in music stores and online. You can also ask local dealers of your instrument if they carry stands. Be prepared to invest no matter what stand you get, but it is an investment that is well worth it. Now, this is most definitely an investment, but it is worth saving up for. You can use a tablet for many different things. For one, you can use it as a computer on the go. You can look up composer information, find directions to a gig, or even look up and order sheet music. There are also some awesome websites such as IMSLP, where you can find tons of free sheet music for different instruments. These free pieces are great for daily sight reading practice or to learn in their entirety. You can also use your tablet to look up recordings of the music you are working on. Tablets start at around a couple hundred dollars, so you should know what you want before you go out and buy one. But a tablet is a good investment if you will be playing music on the go or if you don’t have access to a printer. This is less a supply and more of a resource. Private lessons will increase the speed of your progress tremendously, and you will learn more with a teacher than you would on your own. While lessons can be expensive, they can also be flexible. You can choose the frequency and duration of your lessons, and even who you learn from. With the internet, you have access to thousands of good teachers from the comfort of your own home. Though if you are just starting, you should probably start with an in person teacher. Lessons are an ongoing expense, and they can cost anywhere from $30-120+ per hour. Those are some of my essentials for a successful musician. If I missed any of your favorite music supplies, comment below! I do plan on doing instrument specific needs in the future, so stay tuned for that! Now that school is out for the summer, you probably have a bit more time to do different hobbies and activities without the pressure of school. Summer is the perfect time to work on your music and your instrument. There are many things you can do during the summer to keep up with music and even get better at your instrument. Since you have a few months before the school year starts back up, it’s smart to not let your skills fall to the wayside. You don’t have to practice all the time, but do enough to keep up. If you will be going to music school in the fall, now is the perfect time to really build your skills so that you can get ahead for the next semester. 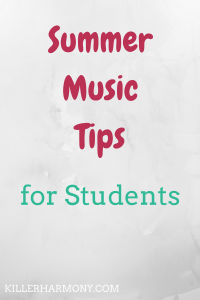 Here are some tips I have to keep up with music during the summer. Whether you plan on practicing for 2 hours each day or only 30 minutes five or six days a week, having a plan ensure that you will stay on track. Sit down for a few minutes and figure out your goals for the summer. From those goals, decide what you need to do to reach those goals. You don’t have to plan out each day, but you should have an idea of how you want to spend your time. Do you have a solo you want to prepare or maybe scales? If you can, meet with a private teacher who can help assess what you should focus on. Planning your practice means that you can focus more on the task at hand rather than just that you need to practice. You can also make plans to perform. If there’s a local group or concert series, you could look into participating for the summer to keep you motivated. It’s oh-so easy to make a plan, but it’s a whole nother story when it comes to actually following that plan. That is why, hopefully, you made a plan that is realistic for you. Do your best to follow the plan you made as closely as you can. Obviously, things happen and plans change. So be flexible, but your plan means nothing if you don’t follow it. If you have a hard time following your plans, add something to motivate you. Maybe you can treat yourself to some YouTube videos or blog posts after you finish a practice session. At the end of the week, after following through on all of your plans, you could take a trip for ice cream. If you miss a session of a day, don’t beat yourself up about it. It takes time to get into a new routine. Be sure to keep going, and at the end of it, you will feel so good. Music and all its components can get expensive. That’s why I love tools and websites that are free. If you want to download sheet music, use IMSLP. They have scores for so many pieces, it’s crazy. There are also online tuners and metronomes. If you don’t have access to a tuner or metronome, using one online is a good substitute. You can also find tutorials on different concepts for your instrument. If you are struggling with technique, look up “[instrument] technique tips” on the internet for help. You can also spend a bit of money and study with a private teacher through a video chat program. Since it is summer and time for a break, be sure to take breaks in your practice. It gives you and your fingers a change to rest so that you don’t burn out. Breaks also give your brain a chance to take in all of the progress you make. Your brain can process all of the concepts you have learned, and it will be easier to execute those concepts in the future. Now that you have more time to practice, you need to use that time well. It is more than okay to take breaks when you need it. Get a drink of water, stretch a little bit, walk around, or do whatever it is that you need to do. It can seem like you should take advantage of all the time you have to practice, but the truth is that it is possible to practice too much. If you spend all day practicing, you will over work your muscles. That can lead to temporary pain or even a permanent injury. Regular breaks allow you to keep progressing without the risk of permanently damaging a part of your body. During your breaks, or you know when you’re up late at night, you can listen to recordings. You can find recordings on YouTube, Spotify, iTunes, and musicians websites. Look for recordings of pieces you are working on so that you can hear what they sound like. This is also good if you don’t have access to an accompanist, so you can listen to the backgrounds. If you are comfortable, you can also listen to recordings of yourself. All it takes is a smartphone with a voice recorder app to get started. Recording and listening to yourself is a great learning tool. As a listener, you will be able to hear small details that you missed when you played the piece. Recordings are truly a musician’s best friend. Well, besides a tuner and a metronome. Now, this next tip won’t work for everyone; pianos need to be moved by professionals. If you can, though, take your instrument outside. Take advantage of the great weather that comes with the season, and play some music outdoors. You can bring your music or play from memory, and you can play scales or your repertoire. Playing outside is a good way to get used to different playing environments as well as provide your neighborhood with some nice music. Obviously, don’t play outside too early or late in the day. Unless you live on a large plot of land, your neighbors won’t appreciate being woken up or kept awake by music. What are your summer music plans? Do you have any more tips to add? Let me know in the comments! There is a common misconception that music is expensive. You have to spend hundreds if not thousands of dollars just to get a good beginner instrument. That is simply not the case. While professional model instruments do cost more, student models can be had for less than $500 (for certain instruments). If you don’t have the funds or the desire to purchase an instrument right away, you can also look into renting one through a local music store. In this post, however, I am going to talk about purchasing an instrument. Different instruments will cost different amounts, so I have broken this post based on a few price points. You have the recorder and the voice as some of the less expensive instruments whereas lower pitched instruments tend to cost more. Let’s look at the instruments! Yes, there are a few instruments that you can start for this cheap. You can start singing, and since you already have a voice, this could be considered free. With the $50, though, you could spend up to an hour working with a private vocal coach to learn how to use your singing voice. If you are not a fan of singing, give the recorder a try. Of course, you probably played it in elementary school, and you probably think it’s an instrument for little kids. It can be, but anyone can learn the recorder. There are actually a few people who play the instrument at a professional level. Wow, right? Don’t knock it until you try it. You can find a nice plastic soprano and/or alto recorder for less than fifty bucks. If you want to get serious about it, avoid those cheap recorders that you find in a toy store. Go to Amazon or a music store and get a better model. If you have a bit of extra money to spend, you can buy a good quality ukulele. You could by a toy instrument for even less then $50, but $100 will get you a better ukulele as well as a beginners book or even a short lesson. The ukulele has become more popular in recent years, and it is a great way to get into music. You can learn melodies and chords, and you can even start your own acoustic band! The ukulele is also fairly easy to learn and make a sound on. All you have to do is strum. There are countless videos and lessons online for the ukulele, so you are sure to find something that fits your needs. If you have some money left, invest in a nice case for your new instrument, because they don’t always come with one. If you have an interest in learning the piano but don’t have thousands of dollars to spend, try an electronic keyboard. You can learn the basic concepts behind the piano without investing so much money. While the best electronic keyboards cost more, you can find a beginner keyboard for this price. You can also get some basic piano books or take a few lessons to get you started. A benefit to playing a keyboard over an acoustic piano is that you can get a pair of headphones. That way, you can practice without disturbing others. Piano is the most common instrument, and there is a lot of music that has been written for it. You can play everything from classical to pop or rock. The (musical) world is at your oyster when you play the keyboard. Guitar is another common choice for amateur and student musicians. There is a lot of music out there for guitar, and you can do a lot with the instrument. There is a small bit of classical repertoire, but the guitar is more common in popular music. If you want to join a jam band, guitar is perfect. You can take it with you places, and you can play it almost anywhere. It can be both a solo and an ensemble instrument. Another great instrument in this price range is the flute. Maybe I’m biased, but the flute is a gorgeous instrument. It is small, so it is super portable. There is hundreds of years worth of repertoire for the flute. Its repertoire is so good, other instrumentalists transcribe them. The flute is one of the most colorful instruments. You can play eerie music from the likes of Debussy or you can even play jazz and rock tunes. This next group has a few more instruments included. If you want to play an orchestral string instrument, try the violin or viola. These instruments are held against the shoulder and are played with a bow. They are also common in symphony and chamber orchestras. The violin is a great solo instrument, and the viola is a mellowed version of the violin. These instruments a good for younger students, because they come in different sizes. You can get a child size violin then upgrade later. If you are more a concert band fan, go for a clarinet of trumpet. Both of these are fairly small, so they are easy to carry, but they are very different. The clarinet has more parts to put together, including a reed. A trumpet has only two parts, but you need a bit more strength to keep it at a proper playing angle. Both the clarinet and trumpet are used in band and orchestra, and the trumpet is also used in most jazz bands. If you have an even bigger budget, you can splurge on other instruments. There are so many great ways to make music, and the more money you have, the more you can support musicians and musical instrument makers. More expensive instruments include the cello, double bass, saxophone, oboe, bassoon, horn, low brass, and percussion. You can find musical instruments for every budget. It may not be top of the line, but you can get the job done. Have you wanted to try an instrument but thought it was too expensive? 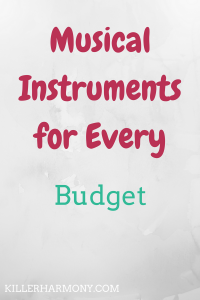 Will you look at instruments now that you know some aren’t as costly? Let me know in the comments! 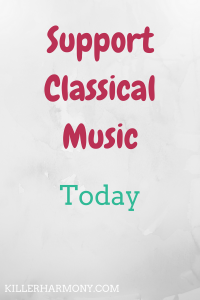 Note: In this post, any reference to classical music will encompass music of the classical western tradition, typically from Baroque to contemporary classical music. In the age of popular music, it can be easy to forget the art of classical music. This form has all but gone away from mainstream culture. There is a small group of classical music fans, but most of its admirers are musicians. It doesn’t have to be this way. I am definitely not saying that we should ignore popular music, but I believe that classical music should also have a place on the radio and in mainstream media. There is at least one thing you can do to propel the development of classical music, no matter your musical background (or lack thereof). One easy way to support classical music is to go see your local symphony orchestra. Most major cities have them, and so do a few smaller towns. You can find information on area orchestras online. Look through the website of your town for information. Or find a university symphony. Going to concerts is a simple way to support the arts. You don’t have to be a musicians yourself to do this. You can make it a family event or a date, or whatever you choose. Many symphonies have a varied season of concerts that will appeal to everyone. And play them! Purchasing music from today’s classical music will allow these artists to continue their careers and spread the love of classical music. And don’t forget to play those recordings. Classical music is great to have on in the background when working, cooking, or just hanging out. If you or your child wants to play an instrument, listening to music will help raise interest and motivation. Buy recordings of instruments that you like. Then you can get a glimpse at the possibilities of playing music. You can purchase CDs or even digital recordings from iTunes or a musician’s website. These recordings are an amazing way to support independent artists, too. I plan on recording some music in the near future, and I plan on releasing it here! Many biographies and autobiographies have been written about classical musicians and their craft. Reading their stories can inspire you to go and listen or make classical music. It is also a great way to figure out what about music interests you. Reading the stories of great classical musicians allows you to learn more about how music can change lives. Also, find some other books on music. I love the book Musicophilia by Oliver Sacks. It talks about how music affects the brain. It is truly an amazing book. If you want to sing or play a Wind instrument, The Singer’s Companion by Brent Monahan is also a must read. If your budget allows, add some music organizations to your list of places to donate. Groups such as the National Association for Music Education (NAfME) that support music and music education are especially important. With the new administration’s lack of support for arts and arts education, our support is all the more necessary. Some students would not attend school if it weren’t for music. Music literally saves lives, and we need all the help we can get to continue teaching generations of musicians. If you are interested and have the resources, try your hand at an instrument (or voice). You can start on a student model instrument and even rent your first one. Then you won’t have to commit to purchasing or continuing with the instrument if it doesn’t work out. Be sure to test a couple different instrument (such as flute vs clarinet) to see which is more natural for you. Obviously, it will be easier to keep up with something you like, but give other instruments a try. You never know what might come of it. You can learn from books or take lessons from a private teacher to help you through your studies. It will take awhile before you can break out the Bach sonatas or Mozart concertos, and that’s okay. Simply learning an instrument will benefit you as much as it will benefit the music world. What are you going to do to support classical music in the modern world? Let me know in the comments!